If you hang out in forums devoted to Halloween and/or haunted attractions, then you’ve probably heard of the Midnight Syndicate. Their music is held in very high regard and always comes up in discussions over what makes for the best spooky soundtrack. Their music has appeared in TV shows, numerous movies and professional haunted attractions. But who are they? 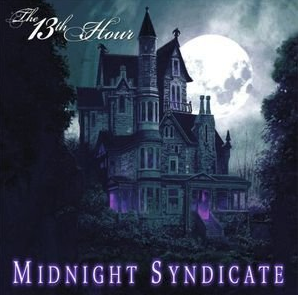 Formed in Chardon, Ohio in 1995 by Edward Douglas, the original Midnight Syndicate was a very different animal than it is today. Although Edward Douglas composed the music and the trademark “soundtracks to movies that don’t exist” theme was there, the 1997 debut album didn’t only feature the scary instrumental music like their work does now. Instead, it also included music from the following genres: “rock, rock-a-billy, techno, rap, new age, humor-pop, jazz, and space [music].” As you can see from that link, they also used to have a much larger lineup. Things got a little more familiar for modern fans in 1998, when the lineup was cut down to Douglas, Gavin Goszka, and artist Joseph Vargo. Opting to do an album consisting solely of the music the Midnight Syndicate would become famous for: dark ambient music. The resulting Born of the Night (for which Vargo provided the name, cover art, vocals and creative direction) was a smash hit and forever cemented the Syndicate’s style. Although he left the group in 2000 to work on a book (and eventually start his own band), Goszka and Douglas kept things going and have continued to release albums to this day. One such album is 2005’s The 13th Hour, the cover art for which was provided by the late, great Keith Parkinson. It’s a sequel of sorts to their 2001 album Gates of Delirium, which took listeners through the haunted Haverghast Asylum. This time around, we’re touring the haunted Haverghast family mansion (no doubt a reference to Dr. Crawford Tillinghast). “Mansion in the Mist” brings things to a spooky start with heavy synthesizer work combined with other effects (including what I swear is a creaking sound of some kind) and light, off-kilter piano work. It brings to mind someone seeing an abandoned mansion at night and approaching it. “Forgotten Path” is a soundscape consisting solely of sound effects. We hear insects chirping and footsteps, as if someone is making their way to the mansion. After hearing a bird cawing, we hear someone going up the steps, opening a creaky door, then entering and closing said door. “Time Outside of Time” is the perfect musical representation of entering an haunted house. The opening piano is soon followed by scary, mournful synth work and light, wordless female vocals (provided by the lead singer of Lazy Lane, Lily Lane). The breathing effects at one point are a great touch and its length makes it ideal for looping. The same goes for “Fallen Grandeur,” a great “general scare” track thanks to its spooky, speedy organ work followed by heavy synth and the occasional chanting vocals. “Hands of Fate” is a very brief effects track consisting of a clock ticking and minor (but heavy) synth) notes. Soft synth and piano work gives “The Drawing Room” a sense of both unease and a period setting. One gets the feeling that the piano is playing on its own. “Mausoleum D’ Haverghast” is great for any scene involving the dead, from mausoleum to graveyards. Its mournful bells are accompanied by the heavy synth and occasional chanting vocals in background. “Family Secrets” starts with a synthesizer riff that should be familiar to horror movie fans, then gives way to a light, steady piano under synths and wordless female vocals. A bell causes a shift to greater sense of danger, then shifts out to interesting variations in both music and vocals. “Last Breaths” is another very brief effects track, wherein we hear softish breathing (and other effects), which suddenly gasps out. “Vertigo” has a pounding intro that grips you and never lets go. A gong, violin and other instruments scattered throughout and the wordless vocals give it a sense of falling down from a great height. “The Watcher” uses medium, steady piano notes and blowing wind effects, which are later joined by light vocals and other effects, to give the feeling of being watched (and being scared as a result). The faint evil laughter at the end is a great touch. “Cellar” is a soundscape that runs just under a minute, which kills me since it’s (in my opinion) too short to work as a looped track while otherwise being the perfect background to any dank, dark location. It could work very well, however, with a motion-sensing device that’s activated when someone has to go downstairs in order to get to the next room in a haunted house. A musical stinger, the soft squeaking of rats and a door opens to start things off. Next comes dripping and more rats, and is that a whisper or just another synth note? Creepy synth effects, along with some light vocals, are a major part of the heavy, pounding “Cold Embrace.” “Hand in Hand Again” starts with the sound of a phonograph starting up, the whirring of which takes us to the soft sounds of a real 1919 recording by Raymond B. Egan. The Midnight Syndicate has upped its scare factor by overlaying spooky effects that eventually overwhelm said song. “Harvest of Deceit” opens with a pounding, steady piano accented by gong strikes and soft vocals. Similarly pounding bells with synth effects are also present and the piano work changes over time before slowing down at the end. “Footsteps in the Dust” uses light plinking noises that sound like tiptoeing to open things, but soon the spooky synth kicks in to show that things aren’t as innocent as they seem. We also get distorted voices of a parent and child (the latter played by the then two year old Mary-Kate Douglas, daughter of the group’s founder), a door slamming and a heartbeat. The piano work in “Veiled Hunter” is medium in both volume and speed, and also picks up synth at times. In fact, sometimes it reminded me of the famous “ki ki ki, ma ma ma” from the original Friday the 13th. “Sinister Pact” uses barely heard vocals, organ, synth work and the occasional bells to create a spooky feel. The soft, distorted voices are a nice touch. Running just under two minutes, “Grisly Reminder” effectively uses soft, light synth work and piano with the occasional use other effects. The short, but scary “Deadly Intentions” uses a whispered female “come with me” and synth work to great effect. That voice seems to have lured the visitor/listener into “The Lost Room,” which is Carpenteresque at times, but still remains its own distinct work. The pounding synth and bass line are joined by a piano, and…are those moans I hear as well? A new twist is added to the room in “Living Walls,” in which a harpsichord intro is joined by vocals and synth work. At this point, it’s easy to imagine faces forming in the walls as the visitor looks the other way. But as the bells enter the picture, so do the breathing and groaning effects that imply the faces have been spotted. It’s sure to be a cool way to accent the famous spandex-based haunt scene of the same name. “Gruesome Discovery” uses soft, quick synth notes and gongs that imply someone running away from danger. Eerie vocals and additional synth notes add to the effect. The drums usher in a child’s laughter followed by closing doors. “Return of the Ancient Ones” starts with loud booms, the sound of falling plaster, soft wind, and then steady series of synth notes. Said synth work gets faster as the vocal chorus and gongs make themselves known. It’s like being stalked by a Lovecraftian entity. It all stops as clock strikes midnight…or does it? The bells slow and distort…even time is being controlled by the house! The title track, “The 13th Hour” is also the final track. We start with another boom, then synth music that increases in speed and volume. Crashing effects add to the sense of running for dear life from something unspeakably evil, pushing all obstacles aside. More moans and effects and effects build, then it suddenly stops as door opens. As crickets are heard, it becomes clear that the evil is confined to the mansion and we’re finally safe. The use of music and soundscapes to imply a storyline rather than directly tell it makes The 13th Hour a more grown up version of those narrated “trip through a haunted house” records many of us listened to as kiddies, like A Night in a Haunted House and Chilling, Thrilling Sounds of the Haunted House. 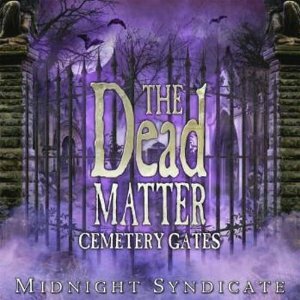 The Dead Matter: Cemetery Gates is an interesting little album which was released to promote the Midnight Syndicate’s then-upcoming feature film The Dead Matter, but was not the soundtrack. Instead, it is a mostly material inspired by the movie, although some work from the film was included. “Called From Beyond” has a heavy synth opening, followed by a gong and other scary touches. Some parts vaguely remind me of the Jaws theme. The light wordless vocals get louder as song progresses and the increased gong use makes me wonder if they’re being used to summon something calling King Kong style. “Nightfall” use a light, but unsettling piano with even lighter synth touches. One gets the sense of someone nervously (but masterfully) playing the piano. “The Hunt” uses its pounding, heavy beat and drums to give both a sense of urgency and feel of being pursued by something nasty. “Across the Chasm” is a quick, alternately heavy and soft piano piece that incorporates other touches to create the effect of creeping over great depth. Although fairly short in length, “Inside the Scarab” creates a building sense of menace via synthesizer, with the occasional use of noise that suggests the beating of an insect’s wings. “Exodus” uses a combination of piano, bells and light synth work to create a spooky feel. There’s definitely a sense of leaving in a hurry. It “picks up” at points, as if a brief rest was cut short and later gets very menacing and pounding midway through. Perhaps that part represents the reason for this exodus? A medium, steady piano opening in “Dark Legacy” leads to synthesizer work, and later a gongs signals the organ to join in. It feels like someone recollecting of the past, and there are otherworldly touches at one point (along with vocals). The light, plinking melody of “Lullaby” is very much like a child’s music box. The occasional use of soft female vocals increases the feel of something supernatural. Things go off-kilter, then synth work and children chanting enter the picture. “Lost” is the first of three bonus tracks, all performed by Gavin Goszka. It (just like the other two bonus tracks) is a throwback to the original sound of the Midnight Syndicate. In sharp contrast to the preceding material on the disc, this has a rock feel and actually has lyrics! The use of synth work and guitar makes for interesting combo, along with a light piano riff and various spooky touches. The interesting guitar opening of “Not Your Saviour” sets the tone for the track, while drums and other synth touches are gradually added (including hand claps). Finally, the otherworldly effects at opening of “Theme to the Dead Matter (A.b.t Remix)” slowly give way to funky effects over piano and the vocals we’re used to from the rest of the album. But they too give way to more claps and even some spacey robot-like(!) noises at one point. None of the bonus tracks are well-suited to use in scaring people and are best either skipped over or tossed into a Halloween party playlist. The music of The Dead Matter: Cemetery Gates’ flows together very well (with the exception of the bonus tracks) without sounding repetitive, making it especially well-suited for both casual listening and/or playing while handing out candy to trick-or-treaters. The same can also be said of The 13th Hour. For use in haunts, the lengths and themes of certain tracks will most likely result in haunters picking and choosing the tracks best suited for the scenes they’ve set up rather than using the entire album. Now that I think about, I can also easily see some combining multiple tracks, such as using both “Footsteps in the Dust” and “Lullaby” to create the aural backdrop for a haunted nursery. As of this writing, the Midnight Syndicate has recently released two new albums, the Destini Beard collaboration The Dark Masquerade and the “best of” Halloween Music Collection compilation (which includes some selections from the albums used in this review). Here’s hoping they have many more to come! Special thanks to Entity Productions for the review copies!